Partly to mostly cloudy. A stray shower or thunderstorm is possible. Low 57F. Winds NE at 5 to 10 mph.. Partly to mostly cloudy. A stray shower or thunderstorm is possible. Low 57F. Winds NE at 5 to 10 mph. Jacob McQuain, of American Building Company, speaks to a job seeker during a previous job fair at Golden Leaf Commons. Southside Virginia Community College Workforce Development and Student Development Services are joining forces to host a regional job fair for employers and job seekers from 1 p.m. to 4 p.m. on Wednesday April 10 at Southside Virginia Education Center at 1300 Greensville County Circle. SVCC Workforce Development Director Courtney Starke coordinated the previous regional job fair at the site in November and said it is a bi-annual effort in Emporia-Greensville to help employers and job seekers in the community and surrounding counties. The event last spring brought employers from Greensville, Brunswick, Sussex, Prince George and Mecklenburg Counties. The field of jobs available included retail, law enforcement, construction, food service, healthcare and others. There were plenty of businesses represented, which in turn brought in many job seekers to the Golden Leaf Commons. The regional job fairs at the Southside Virginia Education Center began on a bi-annual schedule in the fall of 2014. The April 10 job fair will be the tenth. Though a list of employers sporting a booth at the job fair will not be released until the event nears, the healthcare field will likely be well represented. 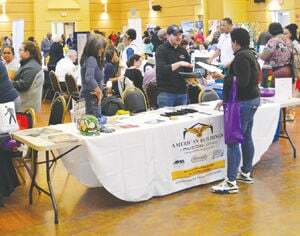 During the job fair last April, Lawrenceville Office Home Recovery Home Aid Staff Coordinator Heather Falls said similar job fairs have brought success in preparing for a career. Those looking for employment are urged to bring plenty of resumes and a photo ID. Those with a WorkKeys Readiness Certificate will be allowed to enter the job fair at 12:45 p.m.